No Sun? No Problem for These Plants. Most homeowners want to add style and curb appeal to their home through landscaping. Plants show your personality, add color and texture to your lawn, and help the environment. Plus, they improve your property value and can make an otherwise plain-looking home become a head turner. If your yard sees mostly shade, though, you may think you’re out of luck with most plants and will have to live without. However, there are actually many plants that do well without a lot of sun exposure. So if your home is surrounded by tall trees or you’re positioned away from direct sunlight, don’t worry. This list of shade-loving plants will thrive in your yard and give it that eye-popping appeal you’re after with little maintenance. The big-bloomed plants do just fine in shade, though they will tolerate a bit of sunlight as long as it’s not too direct for too long. Another benefit is that the blooms hold up well and last from spring to fall, giving you color and beauty for most of the year. While these are only annuals, they are low-maintenance and bloom regularly until met with frost. They also come in a variety of shades to match your home and do well in the ground or in planters. Ferns are hardier than most people realize, and they love shade, as they tend to dry out and brown if given too much sunlight. They prefer to be kept moist, but they can tolerate drought once well-established. Given their ability to grow outward, they can take up space where needed. 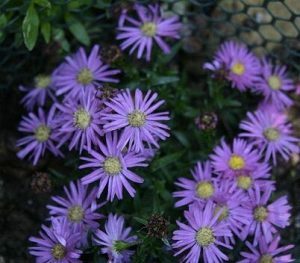 Another annual, these perky plants produce purple, white, pink, or yellow flowers and last from spring to fall. They’re known for attracting hummingbirds and do well without sun. Many people plant these in pots are hang them in baskets, but they’re also great for ground coverings. So see, your shady lawn can have color too! There’s always a way to spruce up your landscaping, no matter what conditions you’re working with. For more tips and suggestions, contact our expert team at Standard Construction & Landscaping. Which Trees Are Best for Your Home’s Curb Appeal? Planting is popular this time of year, but there are some landscaping projects that can hurt your home’s curb appeal more than help. It’s common to want to add color and beauty to your yard, especially as the weather gets nicer. Many homeowners want to add some planting projects to their yard to express their personality and give them an opportunity to get outside. However, it’s wise to also think of any landscaping you do as a means to add value to your home in the event you sell it down the road. Any real estate professional will tell you adding beauty to your yard is great, but not everyone agrees on what’s beautiful when it comes to plants. That’s why they, and we, typically tell homeowners to stick to neutral landscaping, meaning plants that are widely accepted and enjoyed. If you’re thinking of adding trees to your property, our experts here at Standard Construction & Landscaping have the top picks that have been shown to appeal to a broad range of buyers and add profitable curb appeal to just about any home. 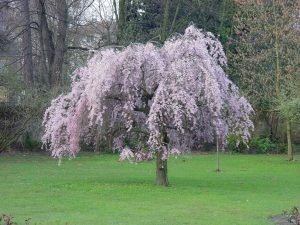 This tree is common, particularly throughout the southeast. It produces pretty pink flowers through summer and is known for holding up well to drought and deer. Crape Myrtles prefer hot climates and love the sun, so you don’t want to tuck them somewhere out of sight. You can likely expect this tree to be 15-25 feet high and an average of 10 feet wide. Sugar Maples thrive in a range of temperatures and aren’t too picky about soil conditions. These trees are hardy and become quite lush and beautiful, especially in the fall with their eye-catching autumn foliage. These trees are nice because they do well in just about any condition. They also get quite large (as much as 75 feet high and 20 feet wide). They don’t attract wildlife like deer, but they do produce pine cones you can collect for fall and winter ambiance. Despite the name, you won’t get any cherries from this tree. You will, however, get beautiful white and pink blooms and a tree that grows as much as 50 feet high. They like to be kept in moist, well-drained soil and don’t do too well with caterpillars, aphids, or spider mites. As beautiful as they are, though, it’s worth a little extra care. Oaks are a classic tree that’s known for going the distance. You’ll often find oaks in the yards of historic homes, dating back as old as 300 years. They’re famous for their size, color, and shade and are sturdy and relatively low-maintenance. With this diverse group of eye-catching trees, you’re sure to find something that suits your home. When you’re ready to plant, Standard Construction & Landscaping is here to help. We’ll professionally transport and install your trees, making sure tree selections and arrangement work with your yard and current landscaping. We’ll also be sure to plant the trees in a manner that encourages healthy growth, and we’ll leave you with tips to help keep your trees looking great for you and any future homeowners! In our 25 years in business, we at Standard Construction & Landscaping have worked on just about every construction and landscaping job out there, and we’ve tried it just about every way. We’ve sharpened our skills and extended our capabilities over the years but have never lost sight of our number-one goal: to offer great service and results, no matter the job. It’s this mission that makes us confident when partnering on projects like construction landscaping in Raleigh and the surrounding areas. We’re not just skilled, dedicated laborers, we’re a team of truly artistic craftsmen who genuinely care about our work and enjoy doing it. We’re passionate about bringing a vision to life, and we do it in a way that has secured our reputation for 25 years. When you work with Standard Construction, you get a team that knows we’re representing us, you, and home and business owners on the job site. Take a look at what we have to offer below, and contact us to partner with Standard Construction on your next construction landscaping project. One of the benefits to working with the Standard Construction & Landscaping team is how multi-faceted our capabilities are. We provide a number of services and specialize in each. We bring a lot to the table as well, having the experience, knowledge, and creativity to offer both design and installation on every project. Read more about our diverse capabilities below. When you have a brand new residential or commercial construction site, we’re prepped to deliver and install sod for both large and small scapes. Our work is always well-planned, clean, and on time. We carefully install sod in a manner that gives it the best opportunity for healthy growth to keep lawns looking their best not just now, but down the road. We expertly transport and install a wide variety of plant options, all planted according to best practices for healthy growth. From Maples and Magnolias to Roses and Begonias, we’ve successfully done it all. 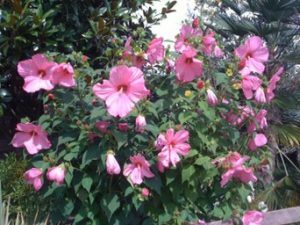 See a list of trees, shrubs, and flowers we commonly plant, and be sure to contact us if you don’t see your desired plant on the list. In addition to landscaping, Standard Construction can also provide hardscaping on residential and commercial job sites. We can work with just about any design, installing pavers, patios, retaining walls, and more to add a clean appearance and upgraded functionality to any area. Our capabilities also extend to carpentry. We’re able to provide quality decking, gazebos, sunrooms, fences, and more to complete your project. Our owner has made a life of construction, so we guarantee our quality on these construction projects is second to none. Contact us today for more information and to discuss what Standard Construction can do for your next construction landscaping project! If you’ve been trying to sell your home in the Raleigh area or are preparing to, one thing is for sure: it’s a seller’s market right now. However, that doesn’t mean it doesn’t take effort to find a buyer for your home, and not only find a buyer, but get the most possible profit out of your property. Though sellers may have the upper hand for right now, you still need a bit of an edge to make the most of your sale. A quick, cost-effective way to increase your property value fairly easily is with the right landscaping design. Landscaping makes a home feel more pulled together and cared for. It’s a way to express the homeowner’s personality and make an impact on guests and passersby, for better or for worse. The right kind of landscaping extends your home’s living space, offering a beautiful, relaxing place for you, your family, and your guests to spend time together outdoors. Landscaping not only offers beauty, though. It’s also functional. Done correctly, it can add shade to your yard, enhance privacy, offer wind protection, and add space for entertaining. There are many choices to make when it comes to landscape design, so we at Standard Construction are here to help those in and around the Raleigh area make smart decisions to help increase their property value and make the most of their home’s appearance. While the choices are many, the right approaches are few when it comes to landscape designs. You don’t want your landscaping to be too personal, deterring people from your home in general. You also don’t want to under or overdo it. Your landscaping should be proportional for your home and yard’s size, scape, and dimensions. A professional landscaper can help you come up with a plan to suit your space and do the job relatively quickly. It’s a simple way to get your home noticed if you’re about to sell or just want to add value for down the road. Consider these tips first to make sure you’re adding ambiance and not an eyesore. Have a strategy. Research your options before getting too far in. You don’t want to pick plants or trees that require a lot of maintenance, don’t thrive well in your area, attract insects and wildlife, etc. You want a little diversity, but not so much that your landscaping feels like a jumble of plantings that don’t “go” together. Match your home and neighborhood. While you don’t need to fall in line with your neighborhood to the last detail, you don’t want your home to stick out like a sore thumb either. Your landscaping should, however, match your home well. If you have a classic, traditional home, then surrounding it with wild, exotic plants will look strange, even if someone can’t put their finger on why. Keep in mind the season. If you’re selling your home, consider that some plants have a short life span. If you’re nearing fall or winter, many plants will lose their colorful blooms and appear drab. Choose perennial plants that will come back every year, and mix evergreen plants in with flowers to ensure you always have some life. Edge your grass. A neatly edged lawn just looks pulled together. Plain and simple. It looks professional, well-cared for, and even regal when done correctly. It communicates that the homeowner has cared for the property, which has a positive affect on interested buyers. Plant trees. Studies show that streets and yards with trees are favored by buyers, and even a couple of trees can make a big difference. Trees provide shade and make people feel more surrounded by nature. They also envelope homes in a soothing way and provide privacy from neighbors. For more tips and landscape design suggestions, contact the expert team at Standard Construction today!